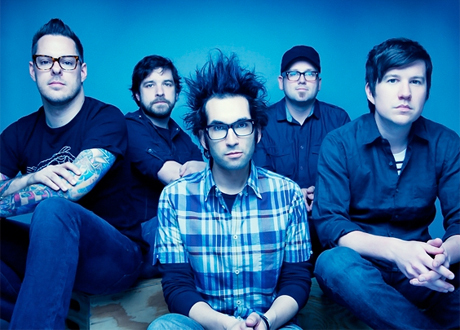 Emo-tinged pop punks Motion City Soundtrack jumped to the majors for their 2010 album My Dinosaur Life, but the group will return to their longtime label Epitaph for the upcoming Go. A press release confirms that the band have bounced back to the punk imprint for album No. 5, which arrives June 12. The full-length was tracked before Motion City Soundtrack had a label for it, which apparently offered the group a "creative freedom they hadn't experienced since recording their debut album I Am the Movie in 2002." The outfit's last album for Epitaph was 2007's Even If It Kills Me. While the recent studio experience supposedly resulted in the most mature Motion City Soundtrack album to date, the band are pumped to be back where it all began for them on Epitaph. "We are all extremely excited to be back on Epitaph records," vocalist/guitarist Justin Pierre said in a statement. "Brett [Gurewitz, owner] and company have truly been a second family to us over the years, both personally and career-wise. We are beyond ecstatic about our new album and the fact that its new home is going to be Epitaph Records." You can hear new track "True Romance" now over at Rolling Stone. "'True Romance' is a love song about two people who seemingly don't have much in common except their love for the time they share in the bedroom," Pierre told Rolling Stone of the song. "In my experience, opposites do attract. And if you can get over the superficialities, you often find you have more in common than you initially thought. Perhaps you even find love."